PREREQUISITE: COMPLETION OF ZEN OF IMPROV 4 OR EQUIVALENT AT ANOTHER COMEDY SCHOOL. PRE-REQUISITE: Completion of Zen of Improv 4 or any equivalent at another comedy school. You are "in the moment" and fully connected to your scene partners. You are watching each other like a hawk. Now, what else can you do to create engaging and exciting improvised theater? Your face and body are there for you, let's use them more! In this workshop you will start by learning some of the essential elements of movement and its application to improvisation in order to create better stage pictures, more interesting character behaviors, and more movement on stage. Own your entire body! Own that entire stage! Let the back row feel your all of your reactions and see your full character! Have you been standing or sitting around a lot? Let's get moving! 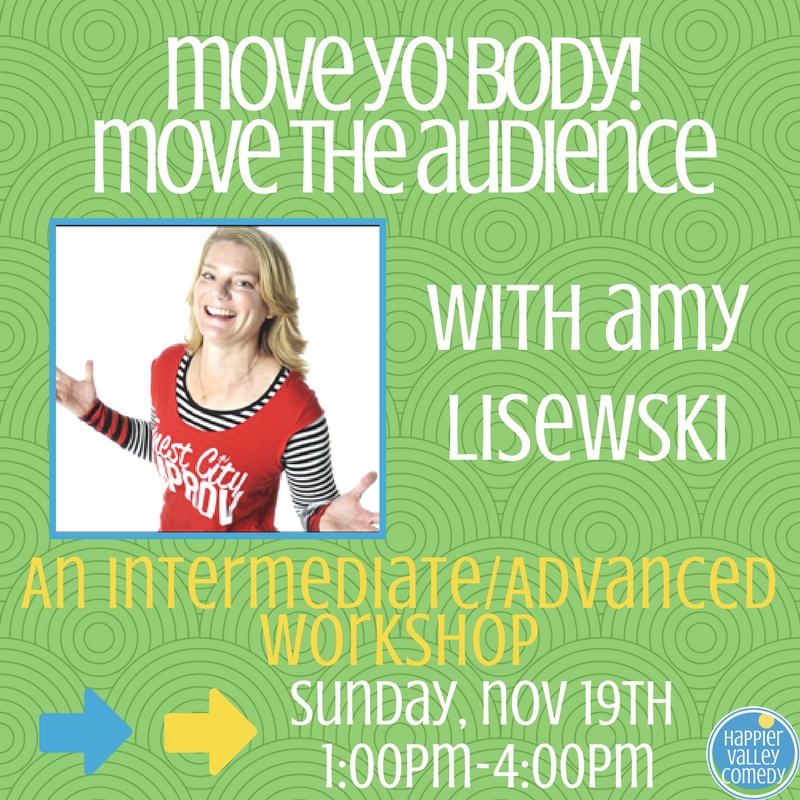 By the end of the workshop, you will be creating more dynamic and visually interesting 1-person, 2-person, and group scenes by using your whole body, the whole stage (or theater), and heightening simple offers made by either yourself or your scene partners. About your teacher: Amy has a background in dance and creative movement that informs her work in acting and improv every time she takes the stage. She is known for big bold movements and fully embodying characters. She is the Artistic Director and Founder of Finest City Improv and the author of “Relax, We’re All Just Making This Stuff Up!”. She teaches the FCI Advanced Improv Conservatory and travels the country bringing the tenets and tools of improv to leaders and teams at various organizations. She performs with Killer Giraffe, Swim Team, and A Single Lady and is a member of the sketch group General Assembly.